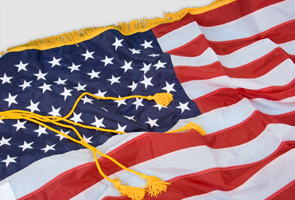 Our Nylon Taffeta flag is manufactured from premium material to give a full, rich, lustrous sheen. It is finished with the finest features including colored-matched thread, embroidered silk rayon stars, lined pole hem with leather mounting tabs, and a golden rayon/bullion fringe. It offers excellent weather resistance when it goes outdoors for parade use. Whatever your use, it will stay elegant looking for years.